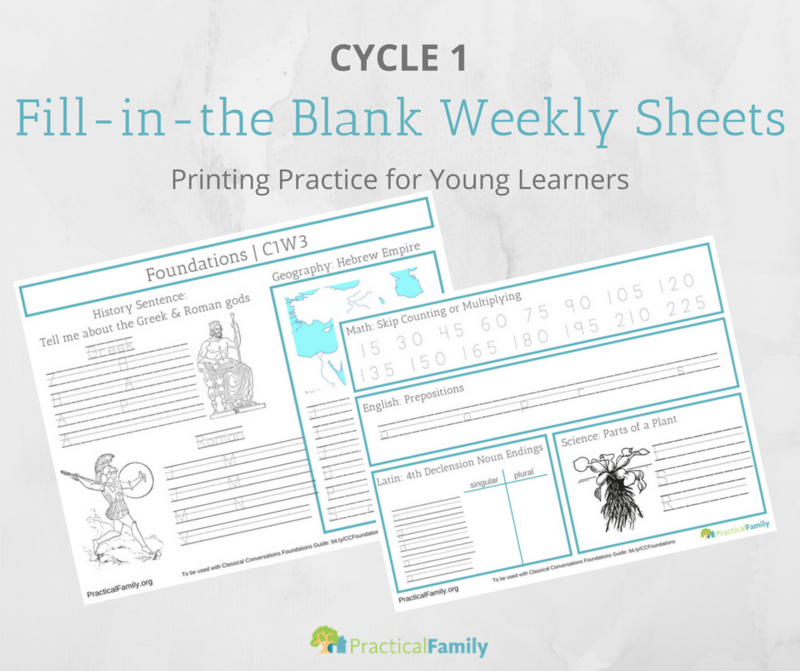 This free download of Cycle 1 Fill in the Blank Weekly Sheets is based on the 5th Edition Foundations Guide of the Classical Conversations Curriculum. You can find out more about this homeschool learning system on our page here: Homeschooling. Traceable sheets were highly requested among our community last year as parents were looking for printing and handwriting practice for their young children. Penmanship seems to have become a lost art in this day of high-use technology. What Happened to the Traceable Sheets??? While the traceable sheets were very popular, the original document contained too much of the actual memory work text to be published on a web page not affiliated with the curriculum company. In order to honor CC’s copyright policies, they were removed in August 2018. However, these original sheets can still be found (legally) on the CC Connected Portal under the name “HonoluluMama2006.” You must be an official CC family (enrolled in a local community), and be subscribed to CC Connected where parents all over the country share helpful files. (It’s about $12 / month per program of study). Studies show that writing helps children to remember the material better, and depending on their different learning styles, the more senses that are engaged when learning, the better. Help your young learn grasp the memory work each week – write, sing songs, dance around, repeat and repeat again. Use these sheets as a tool as you implement other processes with them. These sheets must be used in combination with the 5th Edition of the Classical Conversations Foundations Guide (click to purchase directly from CC). Download our sheets by filling out the form below.